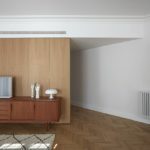 The project that we are showing you is the product of DG Arquitecto Valencia’s work method, which always starts with the analysis of a series of conditions that we incorporate into our project until we achieve, in the most simple and direct way possible, the final solution that best suits the existing space and the needs of our clients. 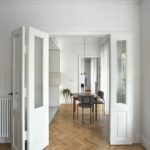 In this case, the project involves an apartment dating from 1930 located in the Eixample district of Valencia that was converted into an office and that is owned by a design and vintage decor loving couple whose children recently have left home. Photography by Mariela Apollonio. This entry was posted in apartments, bathroom, bedroom, kitchen, living and tagged apartment, bathroom, bedroom, DG Arquitecto, house idea, houseidea, kitchen, living, myhouseidea, Remodeling and interior design project on January 14, 2018 by admin.